On Sunday, Feb. 14, while romantics celebrate Valentine's Day with chocolate and flowers, 10,000 or so runners will show their love in a different way: by hitting the pavement as part of the 26.2 with Donna, the race to finish breast cancer. Among them, just as she has been each year since the race began in 2008, will be Kristi Pritchett, an echocardiographer at Mayo Clinic's Florida campus. Like many people who will join her at the starting line, Kristi has some very personal reasons for participating. She is a breast cancer survivor herself, and her sister, Jan, has twice been diagnosed, Kristi says in a profile in this year's race program. "These marathon events are personal on so many levels," Kristi says. The events are also a powerful tool for supporting both breast cancer research and patients. The marathon donates 70 percent of race proceeds to research at Mayo Clinic. The remaining 30 percent goes to The Donna Foundation, which provides financial assistance to women living with breast cancer. Mayo Clinic has received close to $3 million since the events began in 2008. "The money raised by the 26.2 makes a difference," Kristi says, adding that her sister is receiving treatment that "stems from research done at Mayo Clinic." And she's hopeful that Mayo's "more recent breakthroughs for triple-negative breast cancer," will lead to additional treatment options. If your Valentine's Day weekend is looking a little lonely, there's still time to get involved in this year's event. 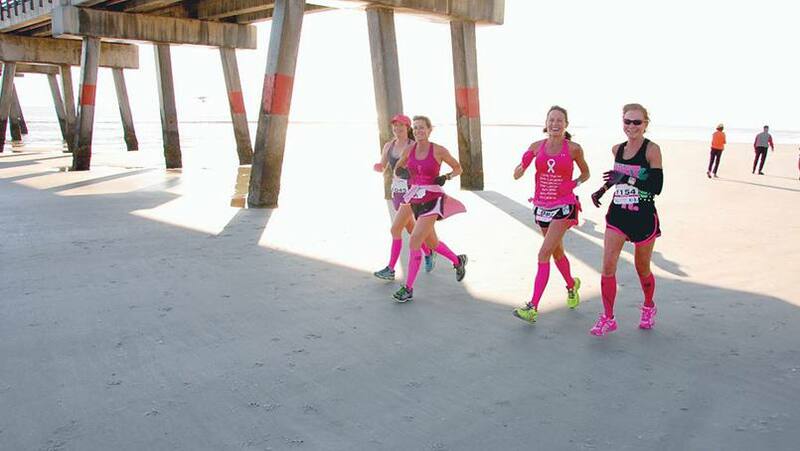 If you're in the northeast Florida area, you can run the race (or cheer on those who are). Registration will be available at the Donna Expo on Friday and Saturday. And for those of you who, like us, are chillin' far from the beach, there's even a virtual option to participate. We'll cheer if you race to leave a comment below. Then, you can use the social media tools to share this story with others.